You know that old saying about trash and treasure... Transform an old mirror–whether it's sitting in your basement or attic or you found one at a yard sale–into something you can use everyday, rather than letting it collect dust. Quick and easy, this project takes a half hour to complete (not counting drying time). Plus, there's something a little fancier about using a chalkboard instead of a white board. This DIY adds an elegant yet organized touch to your interiors. Hang it in your kitchen, your home office, mudroom, or a kid's room for an at-a-glance reminder of what needs to be done on a day-to-day basis. Clean the surface of the mirror, and dry completely. Use a microfiber cloth instead of a paper towel. A paper towel will leave lint on the glass that can get stuck in the paint and primer. Using painter's tape, cover the edge of the mirror (where the frame meets the glass). Take the frame outside, and lay it down on some newspaper. Place the mirror on top. Cover any parts of the frame that are still exposed with newspaper or paper towels and secure. Note: If you're using a picture frame instead, you can remove the entire glass or plastic piece from the front of the frame, so you won't need to tape and cover it. Start priming the surface, following the directions on the spray can. For best results, don't spray too close to the glass. It will cause the paint to run. Spray, and move across the surface in quick fluid motions. Let the primer dry completely. If it's cold outside, it might be smart to bring the mirror inside to dry. If the temperature is too cold or too humid, it will keep the paint from drying. Using the chalkboard spray paint, cover the glass surface completely with the same spraying technique that you used with the primer. For added durability, we recommend doing two coats of the chalkboard paint. Once both coats are complete, remove the painter's tape, and let it dry completely. While the paint might look and feel dry to the touch, let it sit at least 24 hours before you try using the chalkboard. 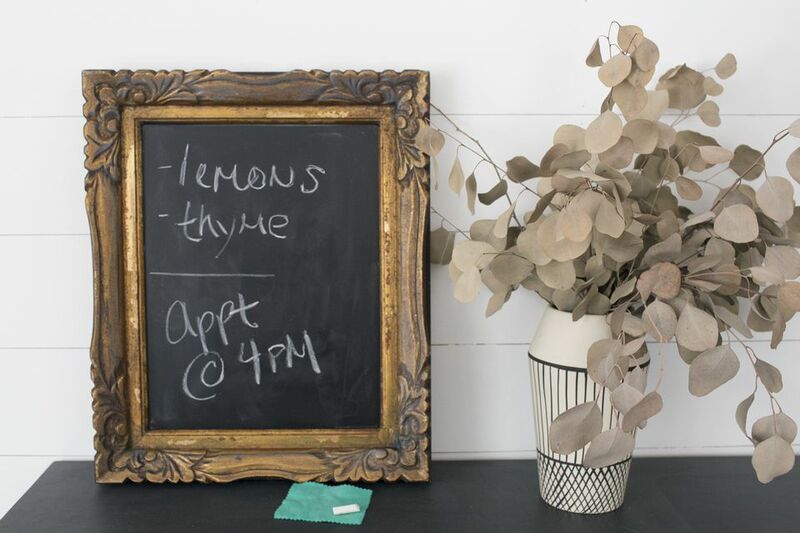 After you've let it dry overnight, you'll need to season the chalkboard; run the side of a piece of chalk over the entire surface of the chalkboard to ensure that you'll be able to erase what you write on the board. If you skip this step, the first message you write will always be visible on the surface. Erase the chalk, and enjoy. Cut a small square out of a piece of felt to create an inexpensive eraser. For a more finished looking edge, cut with pinking shears. Use this new decor piece as a memo board, menu, or a place to jot helpful reminders.